If you have questions about our products or would like to place an order, please feel free to contact us. These slippers are all hand made from our own Cotswold wool. They are one of a kind in that no two sets of slippers are identical. Available in sizes from Infant to Large Adult. They really are light, warm, long lasting and hard wearing. Non slip soles available upon request. Washable - using the usual way of washing wool: cold or luke warm water and air dry (never put in a dryer). Prices are $35 for infants, $45 for a child and $70 for an adult. Greatly desired by artisans, our Cotswold wool locks are carefully hand picked for quality. The shine and curl of Cotswold wool is unique and beautiful. Our wool is 100% farm raised and naturally Grown. Our sheep are happy and content on open pastures where they free range on chemical-free fields. Cotswold sheep are a heritage breed and our work helps preserve their survival. 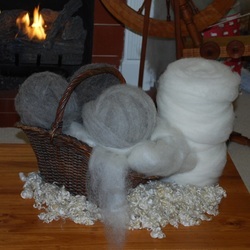 Wool, raw fleece, & roving. All farm raised and naturally grown. Inquire for current product availability & pricing.